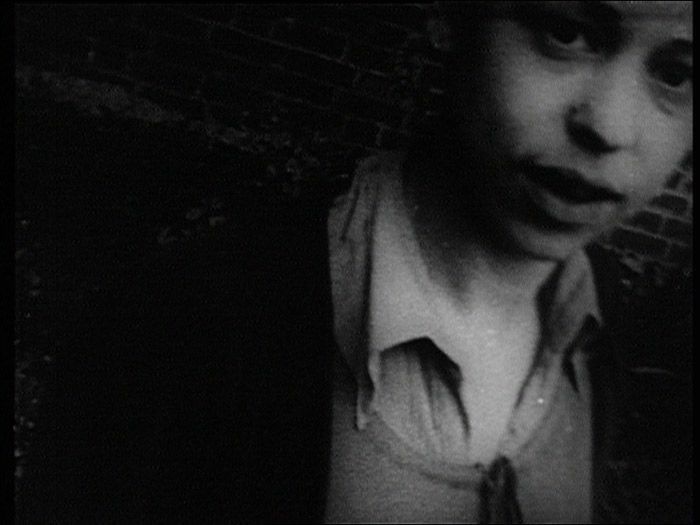 British filmmakers led a drive beyond the screen and the theatre, and their innovations in expanded cinema inevitably took the work into galleries. After questioning the role of the spectator, they began to examine the light beam, its volume and presence in the room. 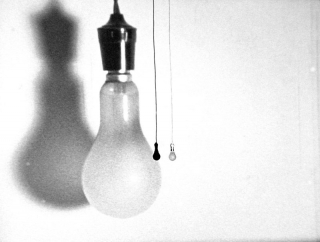 In a step towards later complex projection pieces, for Castle One, Malcolm Le Grice hung a light bulb in front of the screen. Its intermittent flashing bleaches out the image, illuminates the audience and lays bare the conditions of the traditional screening arrangement. Take Measure, by William Raban, visually measures a dimension of the space as the filmstrip is physically stretched between projector and screen. To make Diagonal, he directly filmed into the projector gate and presents the same flickering footage in dialogue across three screens in an oblique formation. Gill Eatherley literally painted in light over extremely long exposures to shoot Hand Grenade, which runs three different edits of the material side-by-side. Light Music developed into a series of enquiries into the nature of optical soundtracks and their direct relation to the abstract image. The film can be shown in different configurations, with projectors side-by-side or facing into each other. Anthony McCall succinctly demonstrates the sculptural potential of film as a single ray of light, incidentally tracing a circle on the screen, is perceived as a conical line emanating from the projector. The beam is given physical volume in the room by use of theatrical smoke, or any other agent (such as dust) that would thicken the air to make it more apparent. More than just a film, Line Describing a Cone affirms cinema as a collective social experience. Screening introduced by William Raban and Anthony McCall. Widening the visual field increased the opportunity for both spectacle and contemplation. With two 16mm projectors side-by-side, time could be frozen or fractured in a more complex way by playing one image against another and creating a magical space between them. Each screening became a unique event, accentuating the temporality of the cinematic experience. Screening introduced by Malcolm Le Grice. 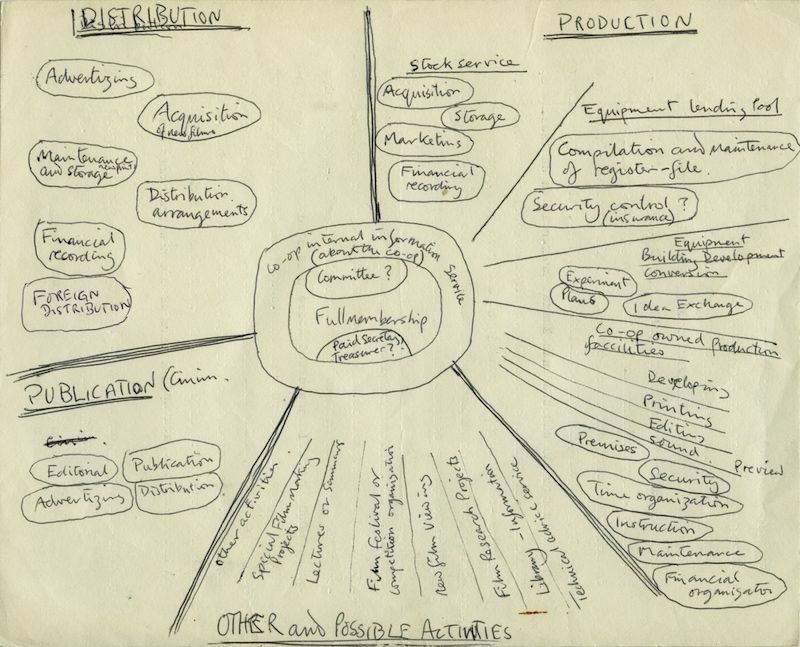 The enquiry into the material of film as film itself was an essential characteristic of the Co-op’s output. These non- and anti- narrative concerns were fundamentally argued by the group’s principal practising theorists Malcolm Le Grice and Peter Gidal. In explaining their (quite different) ideas in some erudite but necessarily dense texts Le Grice and Gidal have in some ways contributed to misunderstandings of this significant tendency in the British avant-garde. (For example, It is not the case, as is often proposed, that films were made to justify their theories.) Le Grice was instrumental in acquiring, installing and operating the equipment at the Co-op workshop that afforded filmmakers the hands-on opportunity to investigate the film medium. His own work developed through direct processing, printing and projection, providing an understanding of the material with which he could examine filmic time through duration, while touching on spectacle and narrative. By contrast, Gidal’s cool, oppositional stance was refined to refute narrative and representation, denying illusion and manipulation though visual codes. His uncompromising position resists all expectations of cinema, even modernist formalism and abstraction. 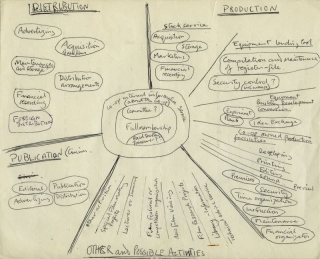 The artistic and theoretical relationship of these two poles of the British avant-garde, who were united in opposing ‘dominant cinema’, is a complex set of divergences and intersections. 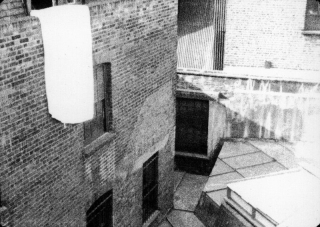 Originally intended as a test strip, the first film produced at the Dairy on the Co-op step-printer was Mike Leggett’s Shepherd’s Bush, in which an obscure loop of abstract footage relentlessly advances from dark to light. The two short films by Roger Hammond and Mike Dunford concisely encapsulate an idea; while Window Box exploits the viewer’s anticipation of camera movement and shrewdly transforms a seemingly conventional viewpoint, the permanence of the cinematic frame is the focus of Tautology’s brief enquiry. By translating footage across different gauges, Crosswaite and Le Grice explore variations in film formats: Film No. 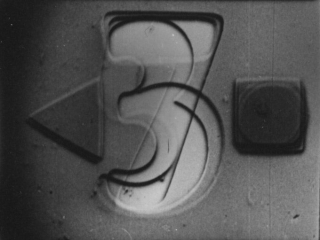 1 uses permutations and combinations of unsplit 8mm, while Little Dog for Roger directly prints 9.5mm home movies onto 16mm stock. In Key, Gidal plays on the ambiguity of an image to challenge and refute the observer’s interpretation of it, while intensifying disorientation through his manipulation of the soundtrack. Du Cane’s Zoom Lapse comprises dense multiple overlays of imagery, vibrating the moment, while Eatherley’s Deck re-photographs a reel of 8mm film, which undergoes a mysterious transformation through refilming, colour changing and printing. Screening introduced by Roger Hammond. The workshop was an integral part of the LFMC and provided almost unlimited access to hands-on printing and processing. Within this supportive environment, artists were free to experiment with technique and engage directly with the filmstrip in an artisan manner. By treating film as a medium in the same way that a sculptor might use different materials, the Co-op filmmakers brought a new understanding of the physical substance and the way it could be crafted. Annabel Nicolson pulled prepared sections of film (which might be sewn, collaged, perforated) through the printer to make Slides. Fred Drummond’s Shower Proof, an early Co-op process film, exploits the degeneration of the image as a result of successive reprinting, intuitively cutting footage of two people in a bathroom. Guy Sherwin uses layers of positive and negative leader to build a powerful bas-relief in At The Academy, while Jenny Okun explores the properties of colour negative in Still Life. Considered and brilliantly executed, The Man with the Movie Camera dazzles with technique as focus, aperture and composition are adjusted to exploit a mirror positioned in front of the lens. For Silver Surfer, Mike Dunford refilms individual frames of footage originally sourced from television as waves of electronic sound wash over the shimmering figure. Contrasting colours and optical patterns intensify the illusion that Lis Rhodes’ Dresden Dynamo appears to hover in deep space between the viewer and the screen. Garratt’s Versailles I & II breaks down a conventional travelogue into repetitive, rhythmic sections. Roger Hewins employs optical masking to create impossible ‘real time’ events which, though prosaic, appear to take on an almost sacred affectation in Windowframe. Screening introduced by Lis Rhodes. 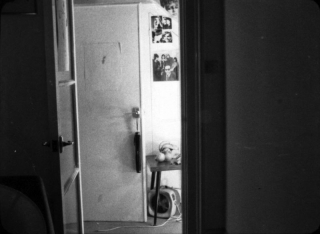 Film is a unique tool for the investigation of time and space. 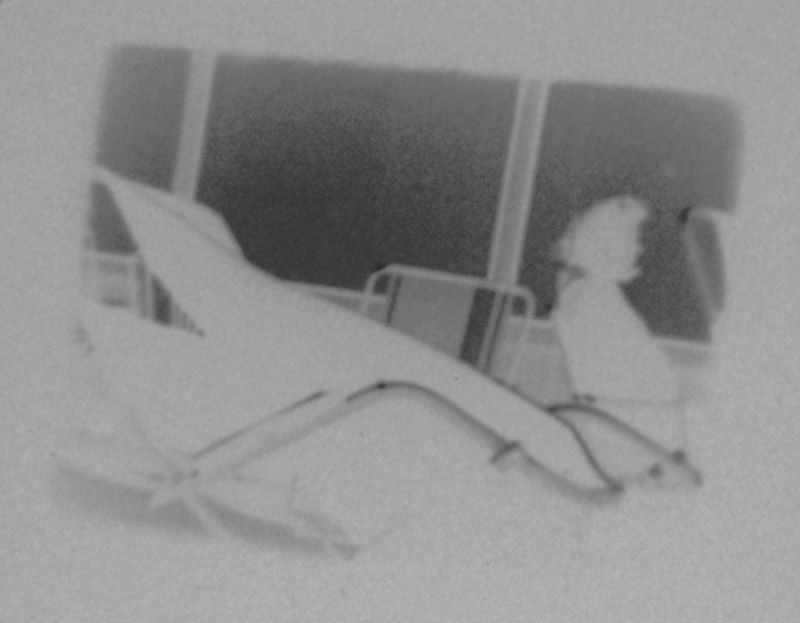 The subjective time of the photographed image may be measured against the objective time of projection through the use of time-lapse, editing and duration. First tracing sunlight moving around a room, then a static study of illumination around a night-time window. The formal Leading Light might surprise those familiar with the more humorous works of John Smith. 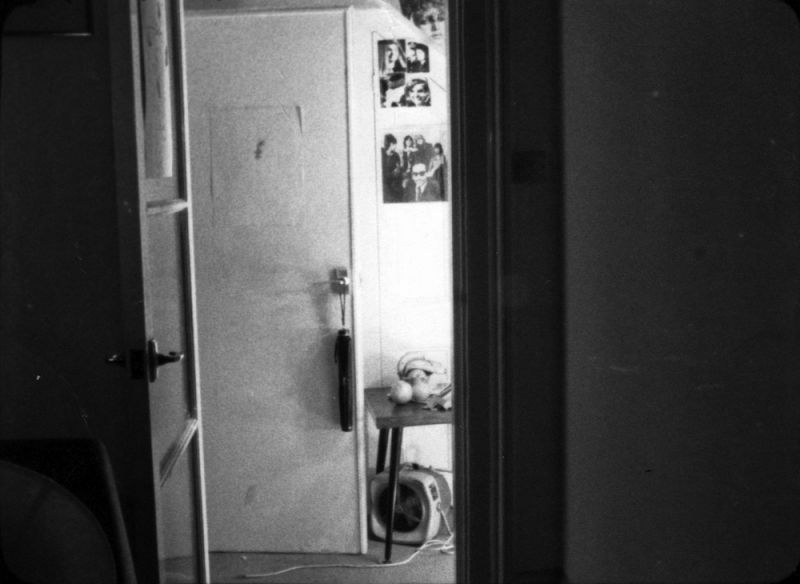 Peter Gidal uncharacteristically used the mechanics of an automated camera to construct the loop-like rhythm of Focus, which zooms through the “static reality” of a mysterious apartment. With an electronic score by Anthony Moore. Sheet develops from a conceptual basis and could be viewed as documentation of an event. The eponymous object is seen in different locations, making this one of the few experimental films that offer us incidental glimpses of London during this period. Le Grice’s film Whitchurch Down (Duration) takes three views of a landscape and combines them with pure colours and intermittent sound in progressive loop sequences and freeze-frames, positing duration as a concrete dimension. Shot to a pre-planned structure, Welsby’s dynamic Fforest Bay II uses speed as the instrument with which he demonstrates the disparity between the cinematic view and the film surface. Via time-lapse, manual exposure and refilming, Broadwalk by William Raban ranges from serenity to rigour. The perceptible traces of human movement appear as ghosts in the tranquil walkway. David Hall, a pioneer of video art, displays a command of the cinematic medium in the layers of superimposition that make up Phased Time2, building up aural and visual ‘chords’ while mapping out a room on the flat screen. Screening introduced by Ian Breakwell. This programme adapts its title from Malcolm Le Grice’s “Location? 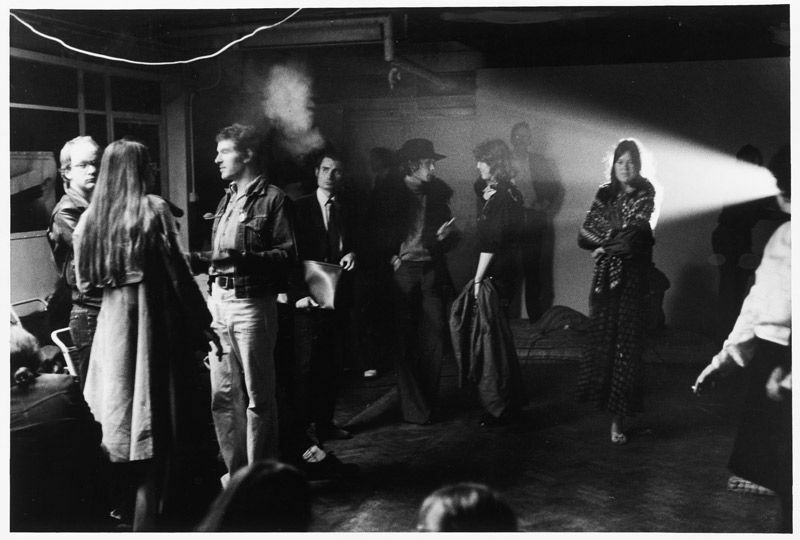 Duration?” exhibition of films and paintings at the Drury Lane Arts Lab in 1968.